Today is Teacher Appreciation Day! 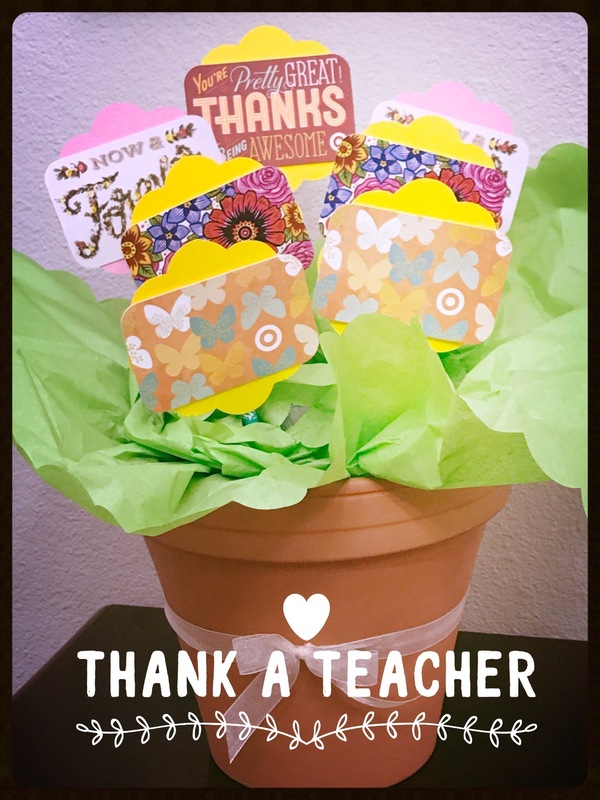 Thank a teacher with this teacher appreciation gift card bouquet today! I have so many favorite teachers in my past it is amazing to reflect on them all. The decades I spent in school cannot be summarized in my fancy diplomas on the wall. My brain was built, challenged, enlightened and much more by every teacher I’ve had. Both in the classroom and out their lessons shaped me, set me up for all my successes and did it all without much thanks from me at the time. Today I regret not expressing my appreciation, but maybe I didn’t even understand the gift and work they put into me to be grateful for at the time. Today I would like to change my lack of thanks. Thank you, to all the teachers, support staff, family, friends, coworkers, supervisors, trainers, bosses, even strangers that have ever influenced my life to bring me to where I am today. There is a saying, “everything I needed to know I learned in kindergarten.” How true it is. The basics for everything we know was learned here. I remember my kindergarten teacher fondly. The homework she pinned to our shirts so it couldn’t be lost or forgotten. The piano she played in the room. The patience she displayed for us all to absorb. Thank you. I am thankful to my kindergarten teacher and every one in between all the way to my last college classes. In one of my last classes a professor asked a life-changing question. Probably not a mind-blowing question and one that has been asked many other times to classes upon classes of students. It changed my life though. A teacher that can cause internal reflection and inspire change without meaning to = priceless. To him, thank you. Being thankful to a teacher should not be limited to those in the profession of teaching. Likewise, being thankful for these lessons should not only come on a designated day. Use this Teacher Appreciation Day to begin a movement in yourself. Move yourself to teach others. Move yourself to influence the good in you. Move yourself to express thanks throughout the year. To try to make amends for my lack of giving thanks in my youth, I’d like to begin showing my children to thank those who touch their lives. Rosanna Pansino made a cookie bouquet for Mother’s Day and became my next inspiration. It was perfect timing for an inspiration for a teacher appreciation gift. Outside food is not allowed in my childrens’ schools, so I had to alter the cookie part. Using the craft portion and assembly of the bouquet I made a gift card bouquet to thank those who teach my babies. It was super simple. I bought all the supplies and followed all the steps from the Nerdy Nummies video, but instead of cookies I taped gift cards to flower cutouts and then to green straws for the stems. It is completely customizable with any fun or favorite store gift cards. I chose Target because I love that store and their cards had floral prints to incorporate well into the design. The amounts on the cards can be catered to your giving allowance also, which is great. 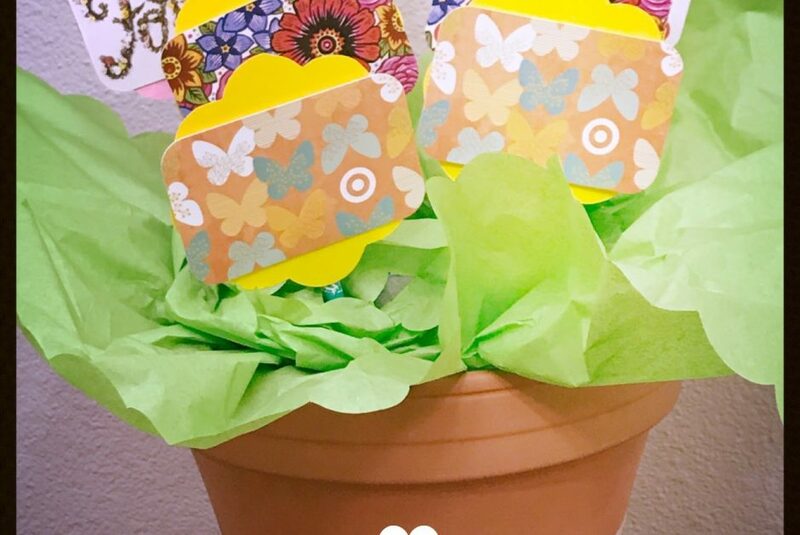 Where will your gift cards for this teacher appreciation gift card bouquet come from? The ideas are endless. This teacher appreciation gift impressed their teachers and our thanks upon them. A little thanks goes a long way. Thank a teacher. Thank another. Who will you thank today? For more inspiration see my other post Keep Smiles Simple and create your own holiday any day!